As fun as they sound, media dinners can sometimes be not that great. Often you clamor over each other to take a gorgeous photo of a dish, and then by the time everyone is done with their pics the food is room temperature. Or, even worse, you get like one bite of a dish because everything is served family style to a dozen hungry bloggers. But, last night I was treated to a lovely media preview to the new Pacific Asian restaurant and bar She's Not Here and left stuffed and (mostly) quite happy. Here's what I ate, what I loved, and what I didn't. First of all, it's hard to remember what Malaga even looked like. The space is GORGEOUS. It's light and bright, with a beautiful exterior and even prettier interiors. It's tropical and floral with pops of bright blues and murals. It's a stunner, for sure. Before we sat down for our meal, we were treated to a cocktail at the bar. 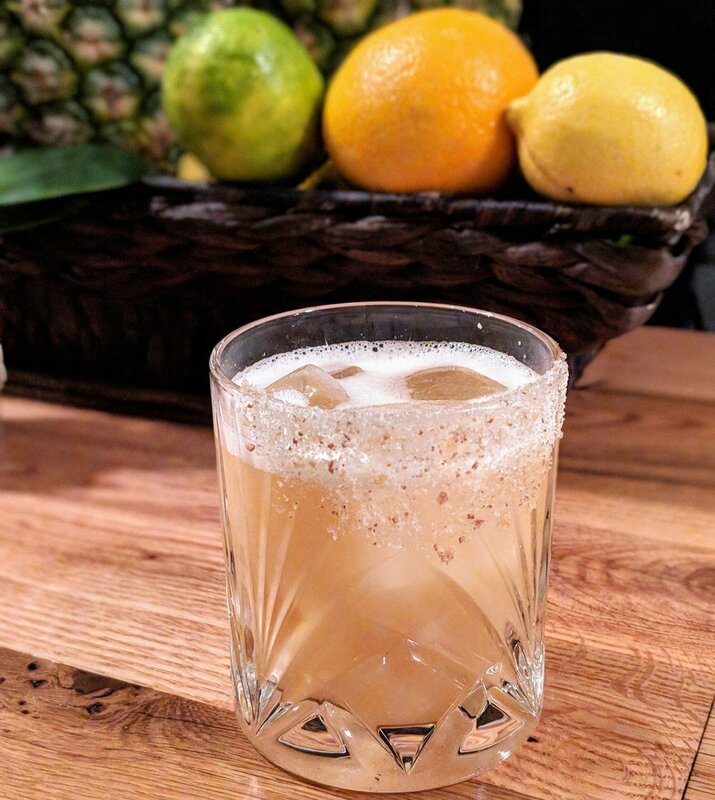 The Smoke (applewood mezcal, plantation pineapple rum, lime, orgeat, toasted almond salt rim) was a very interesting cocktail I would have probably never ordered, but I'm so glad I got to taste it. It was smoky without being too overpowering, and the toasted almond salt rim kept the whole sip incredibly balanced. Definitely worth a try! We sat down to a chef's tasting menu (my absolute favorite way to eat, by the way) that consisted of a ton of fresh seafood and a couple of heavier dishes. Of the raw bites, my favorites were marinated yellowtail with lychee, green apple vinegar, and pickled Asian pear; Tasmanian ocean trout with passion fruit; otoro (blue fin belly); and the striped jack nigiri. But, seriously, all of the bites were scrumptious! I can't wait to go to town on their nigiri menu. Of the warm dishes, a Galbi style pork rib was the clear winner. It was sticky with a garlic sweet soy glaze and cooked perfectly. After I absolutely demolished my rib, I finished off with a palate cleansing pickled shishito pepper. We also ate a tempura cod dish I actually don't remember too much about (whoops) and a vegan ume shisho temaki handroll that was great but didn't measure up to all the amazing seafood. All in all, the meal was amazing, with some truly delicious standouts and inventive cocktails. Plus, the restaurant transports you to a tropical hotel lobby in a faraway locale, and feeling like you're on vacay is never a bad thing. She's Not Here opens to the public on Wednesday, August 15 at 440 W. Second Street.